By submitting this application for your company (the Entrant) or brand to be listed on the British Travel Awards 2019 (the Organiser) online voting form, you agree to be bound by these terms and conditions. A registration fee of £150.00+VAT will be applicable for each category in which the Entrant has selected to be listed. Entrants applying to list more than one company or brand must complete a separate registration form for each company or brand. In the absence of an official purchase order number from the Entrant, the name of an authorised officer or agent for the Entrant will be deemed as a contract between the Entrant Company and the Organiser. The category(s) in which the Entrant will be listed. The fee payable for said listing(s). The registration fee is non-refundable and should be paid in full against the registration document by 18th June 2019. Failure to remit the full amount by this date will result in the Entrant or their brand being removed from the category listing. Payment can be made by BACS or over the telephone using a debit or credit card as described on the registration document. 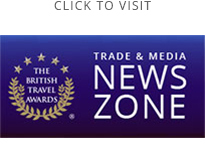 The official British Travel Awards 2019 "Nominee" logo and "Vote for Us" buttons in various file formats for online and off-line applications. The Entrant's unique url to open the direct voting pop-up window from their website. Guidelines on how to use these promotional assets to encourage consumer voting. The Organiser's reserve the right to remove any category or change a category's criteria at any time up to 30th June 2019. In the unlikely event of a category removal or change, companies affected by this action will be invited to change their listing to an alternative category. Should the Entrant find this to be unacceptable - and they have paid the category registration fee - their fee for the removed or changed category will be refunded. Entrants entering into a sponsorship agreement with the Organiser will be entitled to gratis listing in up to five categories. Standard charges and conditions will apply to any additional listings. The British Travel Awards programme is owned and produced by UK Travel Awards Limited. In the event of cancellation for any reason, including but not limited to: force majeure - acts of war, terrorism, death, cancellation by a third party controlling body, venue owners, and any contractor, sub-contractor or lease holder to the event to which the invoice relates the Organiser will refund the Entrant any monies paid less reasonable and non-refundable costs incurred pertaining to the event and materials supplied.